HARVEST TIME: Summer - if you are lucky. Ripe when fully colored and slightly soft. Pick the flower petals while in bloom for use in salads and garnishes. Use petals only, not entire flowers. GROWTH HABITS: Small tree, white to light-pink spring flowers, and delicious summer fruit. 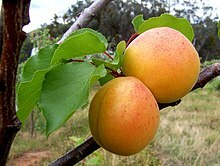 It’s an easy-to-grow tree, but the fruit production is another matter. The early blooming habit often causes a loss of fruit because of late freezes. CULTURE: Normal maintenance program using the basic organic program and spraying Garrett Juice with additives of baking soda and garlic. HARVEST AND STORAGE: Harvest as soon as fruit is ripe and before the squirrels and birds beat you to it. Eat soon or store in a cool, dry place. 32-40°. Will keep about 2 weeks. NOTES: Beautiful little tree for the landscape but not a good high production fruit tree for the orchard. VARIETIES: Decent varieties for Texas are Bryan, Blenheim, Hungarian, and Moorepark. Manchurian may be the best choice; Mongolian is the worst.